Frank DiBussolo has been a professional musician since 1965. During this time he has worked with Frank Sinatra, Tony Bennett, Diana Ross, Diane Carroll, Vicky Carr, Bob Hope, George Burns and Dom DeLouise and others. As a soloist he has been featured with the bands of Buddy Rich, Dizzy Gillespie, Art Blakey, Bucky Pizzarelli, Howard Alden, Lester Lannin and more. He is a graduate of Widener University and the Combs College of Music where he earned the Master of Music and Doctor of Musical Arts degrees. He has served on the faculties of Swarthmore College, Moravian College, Lehigh University and the Combs College of Music. 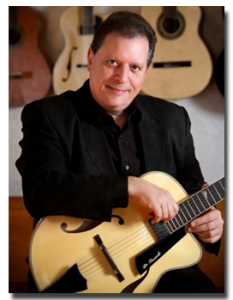 Dr. DiBussolo has recorded extensively and can be heard on the Naxos, DBK and Lost World record labels. For his work in the recording industry, he has been nominated eight times for The Grammy Award in various catagories. He is published in Guitar Player , The Educator and Just Jazz Guitar magazines as well as in the Groves Dictionary. Saucon Valley Music is proud to offer pre-audition courses to preparer students interested in auditioning for the Lehigh Valley Charter High School for the Performing Arts.